Hello everyone! I promised to keep an eye on my Clean & Simple Die Cutting series and since it Thursday today it’s time to share a new episode! You might have seen this one on the Spellbinders Youtube Channel, as it has been uploaded there some time ago. If not – grab a cuppa and enjoy! Today I’m focusing on negative die cutting and I’m talking about 3 different ways you can do negative die cutting. This technique allows you to use your dies in a whole new way. Take the Kitty Play die set for example. Cats have a lot of filigree elements to them and look very elegant and classy; by using only a negative I was able to turn those images into more graphic kitties. I love using this technique and in my opinion it works with a lot of different shapes. I have done one recently using a heart die, you can check it out here. Each of my cards have negative die cutting done a little differently. The first one (on the left) is very basic. The middle one has a fun blue shadow and the one on the right has a cool outline done in green. All of these were rather easy to achieve. 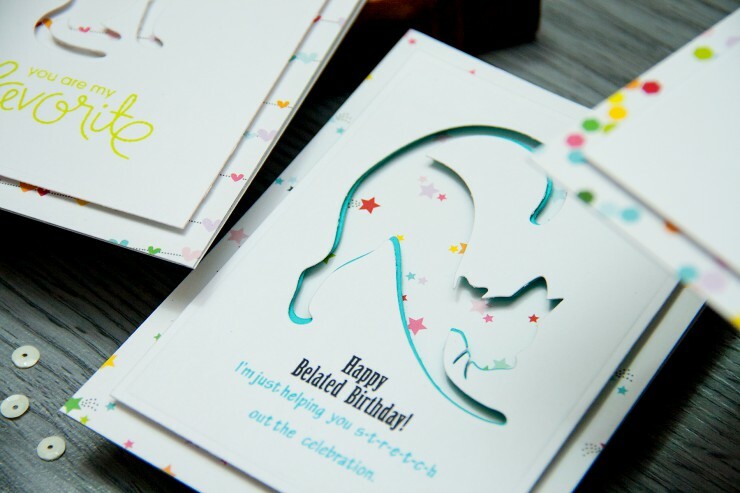 All you need to be able to re-create the outline and a colored shadow effect is a bit of colored cardstock and some free time. 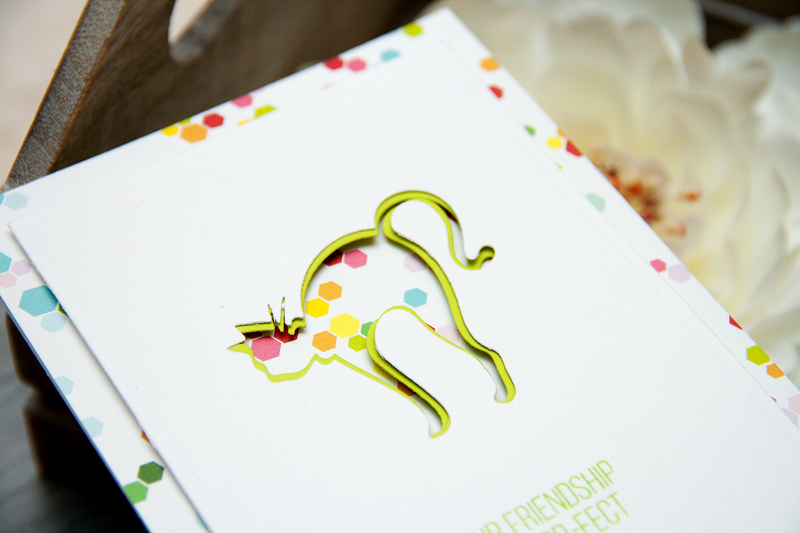 You can also use these cats in a more traditional way on a more traditional card and maybe add some of the other elements from this die set – a fish bone or a ball of yarn. These are wonderful! I love the ‘mat’ that you created on the inside for the cats! Absolutely love the negative technique! Never thought of this. Now that I know I’m sure I’ll be using it. Thank you Yana’s for sharing your talent with us. thank you so much, Kathy! I’m excited to see what you create! Wonderful. A great idea for a shadow when you don’t have 2 sizes of dies. 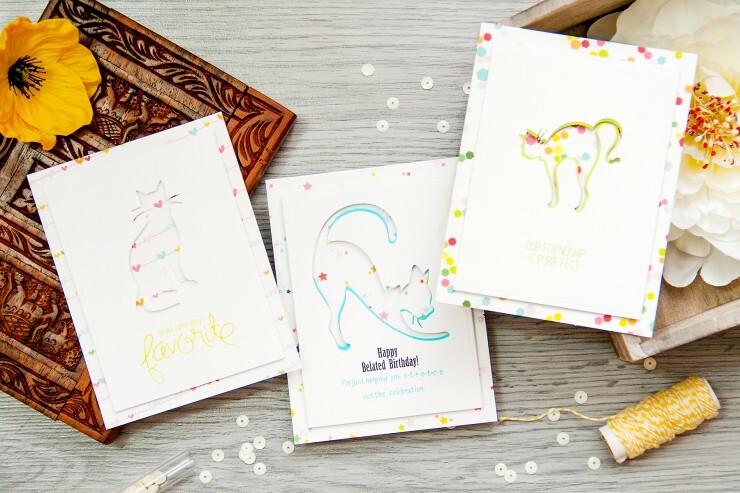 Delightful cards. You are so talented! Can you please tell me the name of the stamp set you used for this “cat project”? thank you, Tant! I believe these came from 3 different sets. One is from Paper Smooches – Uplifters, the other one is from Stampendous – Birthday Wish and the last one is from Simon Says Stamp – QUITE THE PEAR set. Fantastic cards! I love the way you added the two different shadowed effects. Always enjoy your videos too! I was wondering what collection the patterned paper is from? Such fun paper but I didn’t see it listed in the supplies. Thanks for the great inspiration! thank you! I’ve added it to the supply list – its Everyday Collection from Avery Elle. These cards are really great. Love how you created the shadows. Thank you so much for sharing. Fabulous technique! Love the cards! love the stamps used, what were they and where do i get them from? thank you, Doreen! I’ve added stamp sets I used to the supply list. These are so cool! Thanks for the video showing us how to do them! Never seen these die cutting techniques…thank you sooooooooo much!